St George was the original capital of Bermuda and is a fascinating and historically significant town. It lies at the eastern end of island in St George’s Parish. To fully appreciate it, it’s useful to know a little about its history and how it was founded. In 1609, the Virginia Company of London sent a fleet of 9 ships from Plymouth in England to the newly established British settlement at Jamestown, Virginia. The fleet, laden with fresh supplies and additional colonists, was commanded by Admiral Sir George Somers. During a fierce storm the flagship Sea Venture strayed from the fleet and was wrecked on the reefs off the eastern shore of Bermuda. Using skiffs, Somers managed to land all 150 crew and passengers on island. The accidental visitors found living on uninhabited island was surprisingly easy. Not only was there an abundant supply of fish in the ocean, but the island was rife with wild hogs. It’s uncertain how the hogs came to be on the island. Some believe they arrived on an earlier shipwreck while others speculate they could have been left as an emergency food supply by Spanish or Portuguese sailors. Whatever their origin, they provided Somers and his men with a plentiful supply of fresh meat. Using salvage from the Sea Venture and wood from the native cedar trees, the survivors built two new ships to complete their original mission. In 1610, the Deliverance and the Patience set sail for Jamestown with supplies of fish and meat from Bermuda. Only two colonists remained on the island. On reaching Jamestown, Somers found the colony decimated by hunger, sickness, and attacks by native Indians. The supplies he brought saved it from oblivion and shaped the history of the US. Back in England, the officers of the Virginia Company learned about the new island and its rich resources and decided to establish a permanent colony. In 1612 they sent a party of 60 colonists to lay claim to Bermuda. Under the command of Richard Moore, the island’s first Governor, they built a settlement called New London; subsequently renamed St George. Although the thatched palmetto huts built by Moore and the first colonists no longer stand, most of the buildings standing in the town today were constructed in the 17th to 19th centuries. Although some serve as tourist attractions and museums, most function as houses, restaurants, pubs, and shops. King’s Square is the focal point of the town. St George’s Town Hall is the most noticeable building here and is situated on the eastern side of the square. Other buildings on the square include branches of HSBC Bermuda and Butterfield, the White Horse, and the St George’s Visitor Information Centre. Ordnance Island lies to the south of King’s Square and is reached by a small bridge. Here there’s a replica of the Deliverance and a statue of Sir George Somers. St Peter’s Church is just north of King’s Square and is the most popular attraction in St George. It was built in 1612 by the first colonists and is the oldest Protestant church in continuous use in the Western Hemisphere. Its treasures include a bible from 1594 and the oldest piece of Bermudian furniture, an altar made by Governor Richard Moore. The church was used as the meeting place for Bermuda’s parliament until the State House was completed in 1620. The Unfinished Church lies just north of the town centre and was intended to replace St Peter’s. Construction began in 1874 but the building was never completed. Today it offers great photographic opportunities for visitors and is a popular location for wedding ceremonies. St George boasts several museums where you can discover more about the history of the town and Bermuda. The Bermuda National Trust Museum explores the role the island played in the American Civil War while the Tucker House Museum offers an insight into early Bermudian life. There are several beaches within easy reach of St George. Tobacco Bay is perhaps the most famous. Achilles Bay and St Catherine’s Beach lie east of it and flank Fort St Catherine. All can be reached on foot in about 15 minutes. Alternatively take a taxi or the private minibus from King’s Square. St George’s major resort, Club Med, closed in 1988 after being severely damaged by Hurricane Emily. Plans to build a Park Hyatt hotel on the site have floated around for several years but nothing concrete has materialised. Current accommodation options in the town include Aunt Nea’s Inn and a few private homes available for short-term rentals. Another option is the St George’s Club. It’s a timeshare complex but frequently offers spare units through hotel booking sites. Options within easy reach of St George include Grotto Bay and Rosewood Tucker’s Point, both in neighbouring Hamilton Parish. Until 2011 St George was used as a port of call by the major cruise lines. These days all the contracted cruise ships now dock at Royal Naval Dockyard (Kings Wharf/Heritage Wharf). Today’s ships are simply too big to navigate Town Cut, the approach to St George. The cost of widening Town Cut could be as high as $70 million and would involve the loss of three islands. There are currently no concrete plans to proceed with the scheme. In the meantime St George is trying to reinvent itself as a destination for luxury mega-yachts. Bermuda Yacht Services have taken over cruise ship terminal at Ordnance Island and now offer docking for such boats. Plans to build a new marina and hotel are in the pipeline. Places to eat and drink in St George include the White Horse, Wahoo’s, Polaris, the Tavern by the Sea, and Wong’s Golden Dragon Restaurant. St George has far fewer shops than Hamilton, but there’s a few interesting options for an afternoon of retail therapy. The Bermuda Perfumery is as much of a tourist attraction as it as a store. Situated in a historic building on Queen Street it manufactures and sells the Lili Bermuda brand of fragrances. Visitors can tour the building and learn about the production process. Most of the other shops in St George are located on York Street or Water Street. Water Street runs west from King’s Square and is home to shops such as Vera P Card (figurines), the Island Shop (island-inspired gifts), and the Book Cellar. York Street runs parallel to it. Stores here include Robertson’s Drug Store (pharmacy), Churchill’s (fine wines, spirits, and cigars), and the Somers Supermart (grocery and deli). In the summer months free guided walking tours of town are held every Monday, Tuesday, Wednesday, and Thursday. They start at 10.45 am outside the Town Hall on King’s Square and last around one hour. At noon following each tour the town crier conducts a mock 18th century trial in King’s Square. The nagging wife is always found guilty and is ducked in the harbour as punishment. The Peppercorn Ceremony is one the highlights of the St George’s calendar and is held every year on the Wednesday nearest to St George’s Day. The Masonic Lodge St George pays a nominal rent of one peppercorn for the use of the State House. It’s accepted by the Governor in an elaborate ceremony held on King’s Square. Another popular event is the Bermuda National Trust Christmas Walkabout. It’s held on the first Friday in December and marks the start of the holiday season. There’s carol singing in King’s Square, late night shopping, and visitors are welcome to explore many of the BNT’s historic buildings, including some not normally open to the public. The government-owned St George’s Golf Course is currently closed. If the replacement for the Club Med ever comes to fruition, it will likely become part of the new development. Most of the other tour and water sports companies that operated from St George moved to Dockyard when the cruise ships relocated. KS Watersports still have a base here and offer jet ski tours around the eastern end of the island. Bus routes 1, 3, 10 and 11 connect St George to Hamilton. Bus number 6 runs from the town to St David’s Island. You’ll need to pay the exact fare in cash or purchase a transport pass or book of tickets. Places to buy these in St George include the Visitor Information Centre on King’s Square and the St George’s Post Office. 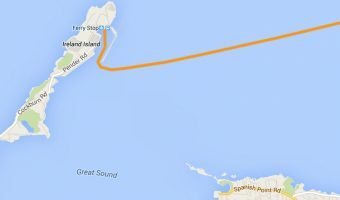 In the summer months a ferry service operates between St George and Royal Naval Dockyard. Scooters are allowed on this route. The St George’s Ferry Stop is situated just east of King’s Square. A private minibus service runs from King’s Square to various places around St George’s Parish including Tobacco Bay, Achilles Bay, and Fort St Catherine. The fare is just a few dollars. Scooters can be rented from Oleander Cycles. Their branch is St George is situated on York Street, next to Robertson’s Drug Store. The St George’s Visitor Information Centre on King’s Square offers advice, brochures, maps, and tickets and passes for buses and ferries. There are ATMs at the St George’s branches of HSBC Bermuda and Butterfield. Both banks are situated on King’s Square. The St George’s Post Office is situated on Water Street. Interactive map of St George. Click on any icon for further information. Parish at the eastern end of the island. Home to a host of historic attractions. Great way for cruise ship passengers to travel to the historic town of St George. Much faster than the bus. Operates in the summer months only. Guidance for visitors arriving by yacht. Includes customs and immigration procedures, details of passenger tax, and links to further resources. 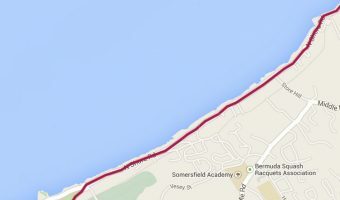 Bus route from Hamilton to St George via South Road. 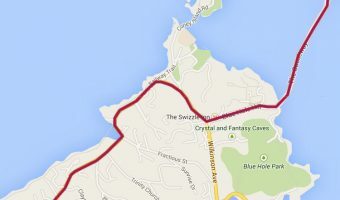 Stops include the Botanical Gardens, John Smith’s Bay, the Crystal Caves, Grotto Bay, and LF Wade International Airport. Buses on this route travel between Hamilton and St George. 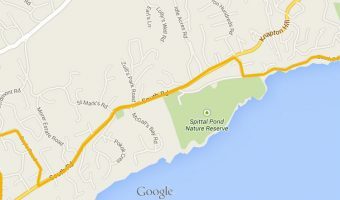 Stops include the Arboretum, Flatts, BAMZ, the Crystal Caves, Grotto Bay, and LF Wade International Airport. Bus from Hamilton to St George. 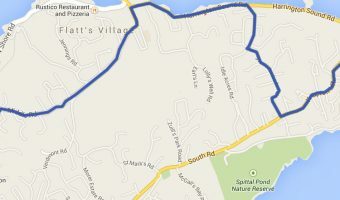 Stops include Flatts, BAMZ, Shelly Bay, the Swizzle Inn, Grotto Bay, and LF Wade International Airport. Bus route from Hamilton to St George. 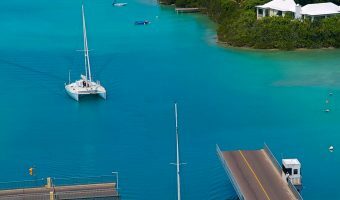 Stops include Flatts, the Bermuda Aquarium, Shelly Bay, Swizzle Inn, Grotto Bay, and LF Wade International Airport.